SPOILERS ABOUND! Seriously, the only way to avoid them here is not to read this so, you know, don’t read this if you fear spoilers. As ANNIHILATION was seemingly nearing its conclusion, I became convinced I had cracked the theme that Garland was using. He clearly had departed from the book series’ themes of the inevitability of evolution and the ways in which it does not just improve what came first but more or less erases it. So, I reasoned, certainly a film like this must have something else in mind. And in that moment, I thought I had discovered it. 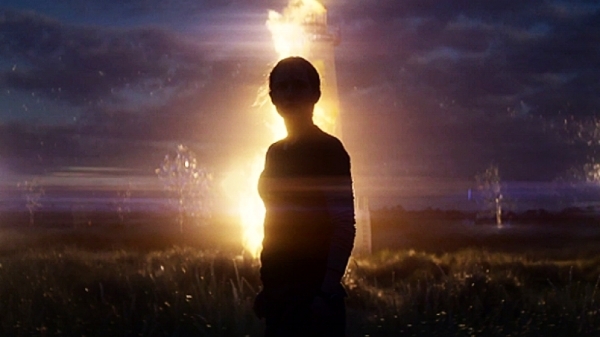 Much like his earlier EX MACHINA concluded with a robot confirming she had gained, essentially, humanity by killing her creator and leaving another sure to die in captivity to gain her freedom, ANNIHILATION was exploring the confirmation of humanity through a different avenue. Somewhere around the halfway point, the theme seems to be called explicitly by Dr. Ventress (Jennifer Jason Leigh). In conversation with Lena (Natalie Portman) she parses the difference between suicide and self-destruction, arguing that most people never try suicide while nearly everyone does self-destruct in some way. This is echoed by other conversations throughout the film, most prominently via Lena explaining to her husband Kane (Oscar Isaac) that the breakdown of cells is an error in coding. When paired with Ventress’s lecture/not very subtle dig at Lena, the film asserts, in essence, our very cells are self-destructive. Returning to the near finish of the film, Lena confronts a silver humanoid like creature that, evidently, is seeking to become her double. This has been hinted at in Lena’s present day scenes where she tells the team observing her that she was seeing “doubling” of mutations, a statement that does not make a lot of sense on its face. In any case, as the silver being struggles to take Lena’s form—quick side theory, the entity can only double you after you break, hence it is struggling so hard to became Lena because Lena is so dedicated to returning home she has yet to break—Lena seemingly eventually gets the upper hand and scorches the being with a phosphorous grenade. As we watch however, it actually appears the silver being is resisting the flame in some way. It/she only truly ignites after touching the skeleton of Kane—who may be the real Kane or the double but we’ll get back to that. And then it not only ignites but it purposely crawls into the hole that leads to what has basically been revealed to be the heart of the shimmer. The silver being self immolation thusly becomes not a death but an act of incredible self-destruction as it/she destroys the entirety of the Shimmer from the inside outward. Therefore, the theme established is that one of the aspects of being truly human is self-destruction. When the silver entity truly become Lena, however briefly, it/she cannot help but “receive” the message that humanity is inherently self-destructive and then goes on to enact exactly that. However, the film’s coda, disappointedly, more or less undermines this idea as Lena and Kane are revealed to both be spawn of the Shimmer thus making that theme more of a nature finds a way one. I’ll be honest, that last minute reveal disappointed me. It felt like the easiest, most obvious choice of the movie and that bummed me a bit. Still, great film. And it led to my other almost assuredly correct theory. The squad that we follow into the Shimmer is explicitly stated to be the first team of only scientists to enter the Shimmer and also the only team of entirely women. The former suggests, fairly strongly, that this is the first set of humans to visit the Shimmer who are not seeking to dominate it. Instead, they are looking to explore, to understand, to record. The Shimmer is still a terrifying and dangerous place for them to be, but not nearly as deadly as it has proven for all the other teams before them, at least as glimpsed through the clues—a video, bleached sets of bones strewn across the beach, and so on. Those prior visitors were here, in essence, to defeat the Shimmer and thus the area defended itself. For this group, the Shimmer instead seeks to give the women what they want. However, the Shimmer is not human so it does not quite get things right. Shepherd (Tuva Novotny) longs to be with her daughter once more, to no longer be alone. So the Shimmer “gifts” her a giant monster attack that kills her, indeed ending her loneliness and putting her together—be it in the afterlife or oblivion—with her deceased child. Thorensen (Gina Rodriguez) seems to be an adrenaline junkie with a desire to be a hero. Again, she is given that opportunity and realizes it, sacrificing her life for the three remaining members of their party. There is nothing more heroic—or to paraphrase a hymn, “no greater lover”—than to die so that others you know and care about can live. And she gets to do exactly that. As references to her self-harming make clear, Radek (Tess Thompson) is a woman long at war with herself, struggling to find peace within her skin. The Shimmer instead offers her peace from without. She can shed her skin and become one with the land, find equilibrium in changing species. She hints at it moments before explaining that while Lena came to find a way to save her husband and Dr. Ventress came to “know” it, neither of those really appeal to her. She feels no need to gain anything from it or overcome anything within it. So the Shimmer gives her the easiest and most painless of deaths: a sort of eternal life as a plant. Dr. Ventress, as noted, wants to know the Shimmer and the Shimmer allows her to do exactly that. The knowledge literally and figuratively destroys her, but it still gives her what she seeks. Finally, last but not least, is Lena. Now, as noted above, Radek points out that Lena came to the Shimmer to know how to “fight” it in the comatose Kane. This, however, is simplification because Radek does not know that Lena cheated on Kane for some period of time. Additionally, she is unaware that Ventress more or less confirmed Lena’s fear: Kane agreed to his Shimmer mission because learning of the affair had broken him in a way that made him make an obviously self-destructive choice. So Lena does not wish to just save her husband, she wishes to achieve some kind of forgivingness through doing so. However the Shimmer concludes, right or wrong, that such forgiveness is impossible. And most likely impossible because she cannot forgive herself first and foremost. So, as we see in those closing moments, it remade her. The only way she could truly reconcile with Kane was to be someone different and therefore, before the Shimmer is destroyed—or, more likely, moves on to its next stage via the Lena it made—it creates a new Lena. The final wish, the final finger of the monkey’s paw. Throughout the film, we see a tattoo "jump" between people before it ends up, finally, on Lena. A snake intertwined into a figure eight eating its own tail, it is also an infinity sign. Infinity is, of course, forever. Forever might very well be what the Shimmer has given Lena. See, in one of the flashbacks to her life with Kane before his final mission, we see her explain the nature of cells to him by way of answering his challenge about God not making mistakes. She points out that cells should, technically, spend forever just dividing and changing but never dying. The fact that they don't in humans--and other animals too, presumably--is the result of some kind of error. Lena obviously leaves the Shimmer changed. What if that is the change, that whatever the Shimmer can do, it also "fixed" her cellular division. Once she is changed and knowing her desire is to return to Kane, the bubble dissipates, leaving her to seek him out. Moreoever, Kane is cured in that moment, enabling him to be her mate going forward. Thus, the Shimmer has not just fixed her but changed the future of humanity, introducing cellular immortality into the gene pool. But we saw Lena win, right? With the grenade and all that? Recall, all the information we get, we get from Lena herself. So there is no guarantee she is telling the truth at any point, nevermind just about her fight with the silver entity. For all we know, the last truth we see is the moment they enter the Shimmer. Everything from the moment they wake up seemingly several days into their journey forward could just be untruths weaved on the fly by the Shimmer turned Lena. I tend to think not, however. I think the reason for the Shimmer’s destruction is certainly a fake. It ending that aspect of itself to, essentially, hide that it now has two sleeper agents in the world. The Shimmer won’t take the world via bubble, it’s going to breed itself into humanity. The rest of the way though, I think the Lena-Shimmer is being fairly accurate and honest. She/it is proud of the “work” it has done, the gifts it has given and therefore sees no reason to not to share them. However, by merging with Lena, she/it knows that it just cannot outright state these things. So it presents them all as a survivor would. In the same way that Shepherd’s fear survived with the monster—in Radek’s interpretation—the Shimmer has retained human aspects from Lena like cunning and obfuscation. She/it tells the truth until it doesn’t and the mountain of reality hides that one little fib, that Lena the human is no more. One of my favorite podcast, Switched on Pop, often invokes the term text painting. I’d never know this music term until I listened to them but now I notice it all the time. Essentially, it is when the instrumentation of the music gives physical form to the words. To use a really hackneyed example, if a song invokes thunder and pairs the use of that word with a drum fill or timpani rumble, that is text painting. If the song makes mentioned of a river and there is a kind of woosh sound at the same time, text painting. And so on. The score for Annihilation does not, of course, do this exactly. There are no words in the score so it can’t craft music to match lyrics. However, it can to match theme. Now I know you are thinking don’t all scores do that? And the answer is no, mostly they don’t. Scores signify changes, compliment action, or reinforce emotion all the time. But rarely do they become a reflection of themes. This score, however, does. To start, it is a chimera of sorts. Everything that enters the Shimmer becomes a chimera as well. 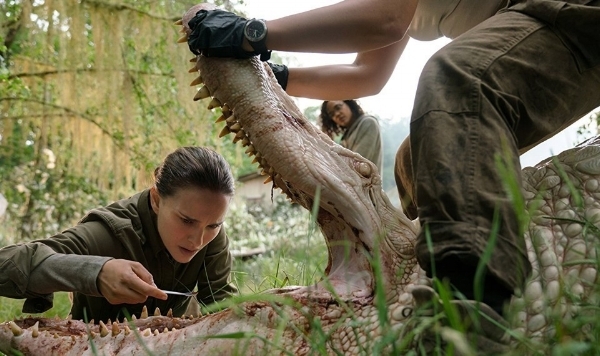 The score combines seemingly disparate elements to make a whole much like the women encounter an animal that is both crocodile and shark or the way we see several trees that are both human and plant. Second, the score evokes familiar elements from other genres to prove out the different aspects of the film. There is a few note guitar piece that is repeatedly used whenever the group is wandering through dense vegetation or entering dark buildings, guns drawn. This connects it with war movies, especially Vietnam movies, that often use a similar musical motif for those scenes. At other times, the score uses a light gentle sound that is nearly always paired with the moments where we and the women are observing how incredible nature is within the Shimmer. Once again, this fits with existing expectations of nature films and movies that linger on gorgeous landscapes. There is also a horror sting that comes up several times, but this is different than the “whoooooom” sound that specifically denotes the Shimmer or the Shimmer being active in some way. Therefore, the score establishes that while there is terror inside the Shimmer, it might be something the Shimmer is actively enacting on our travelers. These musical motifs are then tossed against one another, co-occurring, transitions, or layering on top of each other to keep us both informed and unsettled. It is a truly incredible bit of work. This is a quick one I just want to throw out immediately. The movie makes it clear from the beginning that humanity is doomed through shot selection. Some are obvious—several shots through the clear plastic quarantine sheeting—but most do not so obviously announce their presence. There are moments where the camera slides behind glasses of water, windows, catches the soap bubble rainbow-like look of the Shimmer off other aspects. Even in the Shimmer, the Shimmer reflects of several surfaces, making the landscape feel even tighter and more claustrophobic. Thus from the start, the look of the film emphasizes to the viewer that even those currently outside the Shimmer or seemingly safe in the Shimmer will find the Shimmer asserting itself onto them. I have no idea what this one means, so I’ll just point it out. Whenever the group is moving, Lena is always at the back. The only exceptions are when the group is specifically in the midst of some kind of action. At those times, she does tend to take point. Also, Lena tends to walk with the gun hanging out her side unless, again, she is specifically engaged or something in the environment makes her think she is about to engage with a target. Like I said, I’m not sure if it speaks to her military training or what, but I found it interesting. The only thing I could think of is that it is a subtle indication of her deceitfulness. She leads from behind, making the others more vulnerable. She agrees with Thorensen they should not go to the lighthouse but in a way that moves them closer to the lighthouse anyways. She does not disclose her husband until she absolutely has to. And so on. But that’s a shaky theory at best.